Nikki Haley, Lindsay Graham, Confederate flag: South Carolina statehouse symbol may come down. 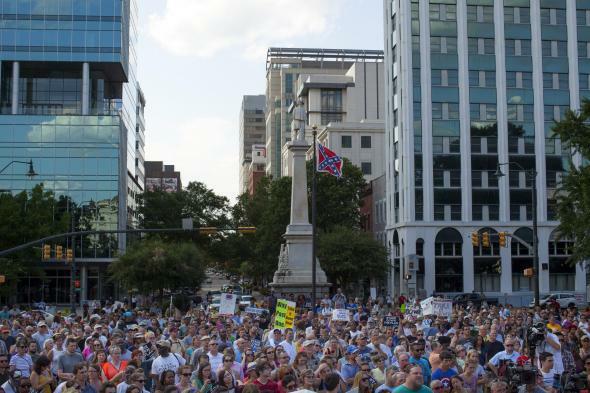 An anti-Confederate flag rally outside South Carolina’s statehouse on Sunday. For many people in our state the flag stands for traditions that are noble—traditions of history, of heritage, and of ancestry. The hate-filled murderer who massacred our brothers and sisters in Charleston has a sick and twisted view of the flag. In no way does he reflect the people in our state who respect and in many ways revere it. Those South Carolinians view the flag as a symbol of respect, integrity, and duty. They also see it as a memorial, a way to honor ancestors who came to the service of their state during time of conflict. That is not hate. Nor is it racism. A hundred and fifty years after the end of the Civil War, the time has come. There will be some in our state who see this as a sad moment. I respect that. But know this: For good and for bad, whether it is on the statehouse grounds or in a museum, the flag will always be a part of the soil of South Carolina. But this is a moment in which we can say that that flag, while an integral part of our past, does not belong in the future of our great state. The murderer now locked up in Charleston said he hoped his actions would star a race war. We have an opportunity to show that not only was he wrong, but that just the opposite is happening. My hope is that by removing a symbol that divides us, we can move forward as a state in harmony, and we can honor the nine blessed souls who are now in heaven. Haley, who later added the “fact that people are choosing to use [the flag] as a sign of hate is something we cannot stand,” said she expects the state’s legislature (whose regular session is over) to take special action on the flag issue and will use her power to call an emergency session if necessary. Both of South Carolina’s U.S. senators and a number of other representatives appeared behind Haley at her press conference and are said to also support the flag’s removal. Original post, 2:29 p.m.: Gov. Nikki Haley will call for the removal of the Confederate flag that flies outside South Carolina’s statehouse, the Charleston Post and Courier reports, while CNN says Sen. Lindsey Graham will also say the flag should come down. Because of a law enacted after a similar controversy in 2000, the flag can be moved only by a two-thirds vote of the South Carolina Legisulature, which is not currently supposed to be in session but is meeting to resolve budget issues. The Post and Courier says that action on the flag issue could be shoehorned into bills related to the budget negotiations.